First it was on, then it was off, then it was on again. When it finally got going, President-elect Donald Trump's on-the-record interview with the New York Times lasted just over an hour. It was conducted at the paper's offices by a range of senior editors and political reporters who tweeted his responses in real time. So what did we learn? In 2012 Mr Trump said the idea of global warming was a hoax devised by China to make US manufacturing uncompetitive. While campaigning in May, he vowed to "cancel" the landmark Paris Agreement on tackling climate change and stop financial support for climate action. And he goes on to say there is "some connectivity" between climate change and human activity and that "clean air is vitally important". But, he reiterated his concerns about the cost to "our companies and the effect on American competitiveness". Trump: The best thing ever for climate change? On the campaign trail, Mr Trump professed his love for Israel but failed to articulate any clear policy on resolving the conflict with the Palestinians. Could his son-in-law - a 35-year-old real estate heir with no experience in diplomacy - hold the answer? Jared Kushner, who is married to Mr Trump's daughter Ivanka, is said to have the president-elect's ear on many issues and is a key figure in his transition team. The millionaire is an Orthodox Jew whose grandparents were Holocaust survivors. Who is Jared Kushner, Trump's right hand man? To judge by Mr Trump's comments to the New York Times, the conflict appears to have risen up his policy agenda. The president-elect has in the past suggested making common cause with Russia in the fight against so-called Islamic State and has even proposed sending troops to defeat the militants. But he has also attacked foreign entanglements, criticising US involvement in the Iraq War. Could he be envisaging a more pro-active role in Syria in his NYT interview? But he tempers this with a subsequent: "I don't think we should be a nation-builder." Image caption Off the hook? At campaign rallies and presidential debates, Mr Trump frequently went on stage to supporters' "lock her up" chants and during the debates said he planned to get a special prosecutor to conduct a fresh investigation. His handbrake turn on that policy became clear only hours before his interview with the New York Times. So why would he now not prosecute Mrs Clinton? While he said a new inquiry was still a possibility he also suggested this would not be a priority. 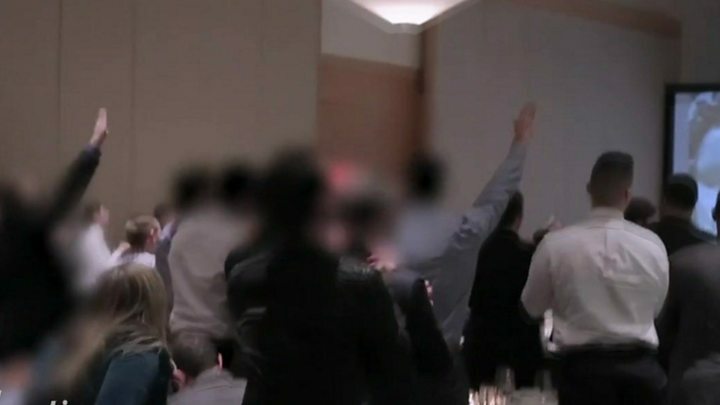 Backing for Mr Trump from the "alt-right" was again thrown into the spotlight after supporters were filmed on Saturday at a meeting in Washington DC hailing his victory with Nazi salutes. Answering questions from the NYT, he firmly distances himself. Concern has been fuelled by his appointment of Steve Bannon, a former editor of "alt-right" publication Breitbart to the post of Trump's chief strategist. 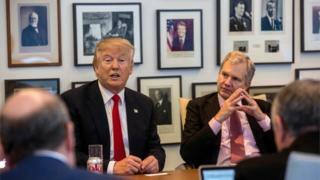 "If I thought he was a racist or alt-right or any of the things, the terms we could use, I wouldn't even think about hiring him," Mr Trump says. He's a billionaire property developer so the issue of whether his business interests could conflict with his presidential activities refuses to go away. To the NYT, he downplays the significance of his holdings, saying they are "unimportant to me relative to what I'm doing". Selling up altogether though, he said, would be difficult. "The law's totally on my side," Mr Trump said. "The president can't have a conflict of interest." The Washington Post described this statement as the "most dangerous" thing he said, and that it had echoes of both President Nixon and Judge Dredd. Mr Trump had always insisted that waterboarding - which was banned by the US in 2006 - was a defensible tool for fighting terror. But now he says it's "not going to make the kind of difference that a lot of people are thinking". His apparent about-turn appears to be down to a conversation with James Mattis, who has held talks with the president-elect about heading the Pentagon. "He [Mattis] said 'I've never found it to be useful,'" said Mr Trump, who added: "I was very impressed by that answer." It's fair to say Mr Trump's relations with the New York Times have in recent months been cool at best. He has accused the paper, and much of the media, of bias against him, prefacing any reference to the NYT with the word "failing". But he evidently left the building with a favourable impression, producing this volte-face.